"Truth is nowhere to be found, and whoever shuns evil becomes a prey. The Lord looked and was displeased that there was no justice. He saw that there was no one, he was appalled that there was no one to intervene; so his own arm achieved salvation for him, and his own righteousness sustained him. From the west, people will fear the name of the Lord, and from the rising of the sun, they will revere his glory. 'The Redeemer will come to Zion, to those in Jacob who repent of their sins,' declares the Lord." 59:1 The problem with prayers not being heard and needs not being met is not because God cannot do something. Point: God is holy and sin will always be separated from God. If we live in sin we are living behind a barrier away from God. These “empty arguments” and “spinning the truth” conceive “trouble” and “give birth to evil” in society. The legal system is only there to help the strong get stronger. Society is without justice and a collapse is near. 59:7-8 All social restraints are gone. Anarchy rules. 59:9-15a The hopelessness of men left without justice and truth personally and as a culture. 59:15b God, the mighty warrior, will arise again. This time it is not to deliver from Egypt, slay Assyria or overthrow Babylon. Who is this enemy? It is sin. It is the people’s inability to live a godly life. It is man himself who cannot honor God. Sin is the final enemy and with the defeat of sin is the victory over death. 59:16 “one to intervene” is fulfilled in Isaiah 53. There was no national leaders to fill this gap. “appalled” is not a word for “surprised” as if he couldn’t believe no human stepped in to help. “appalled” speaks of his holy horror of sin and its devastating results on mankind. 59:18 “repay” is the verb salam and comes from salom or peace God will give “peace” to those who fear him but he will “bring peace” or “settle the accounts” with his enemies. The Lord will provide ultimate deliverance from sin and death! At that time culture and society will be firmly established in righteousness. For he will come like a pent-up flood that the breath of the Lord drives along. 'The Redeemer will come to Zion, to those in Jacob who repent of their sins,' declares the Lord. Cagar (Hb) - shut (Eng) - The Hebrew word cagar means “to shut,” “to close,” “to shut up,” and “to imprison.” In Joshua 2:7 the gate in Jericho is cagar. 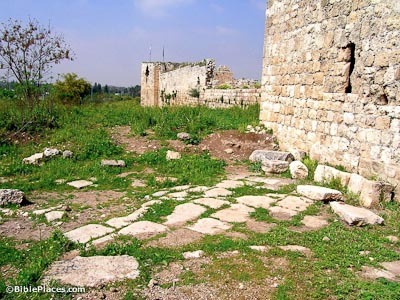 A wall that David had broken down to expand the city is said to be cagar when it is fixed by Solomon in 1 Kings 11:27. In Judges 3:22 Ehud’s sword is lost when the fat of the king is said to cagar around the sword and handle. Until the ultimate day of salvation and deliverance, I will do my part to establish justice and integrity in society by being just, honest and walking in righteousness today. Harvest outside Ashkelon on the costal plain. 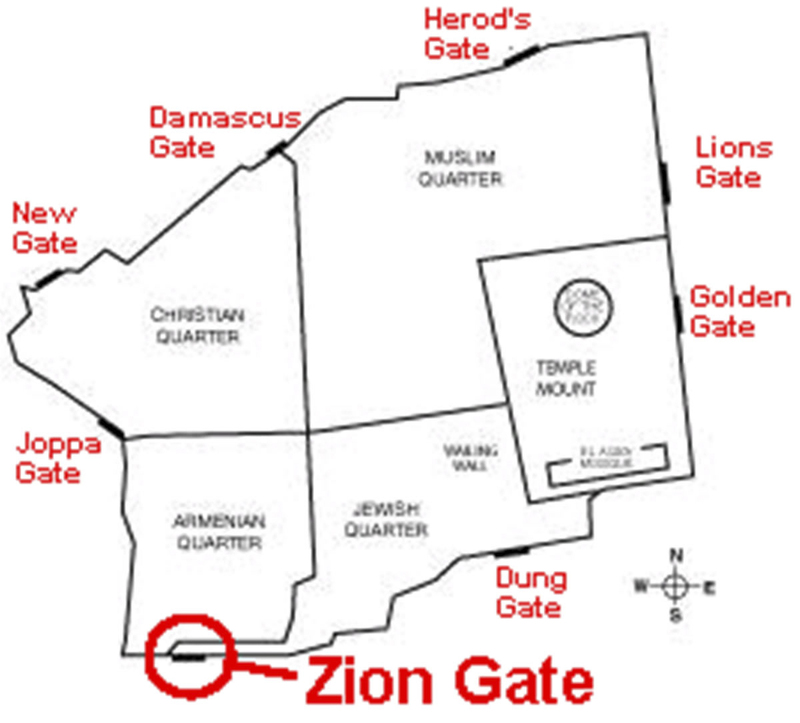 Map identifying the eight gates of the Old City Jerusalem with Zion Gate highlighted. "They eat the bread of wickedness and drink the wine of violence." 10 When the queen of Sheba heard about the fame of Solomon and his relationship to the Lord, she came to test Solomon with hard questions. 2 Arriving at Jerusalem with a very great caravan—with camels carrying spices, large quantities of gold, and precious stones—she came to Solomon and talked with him about all that she had on her mind. 3 Solomon answered all her questions; nothing was too hard for the king to explain to her. 4 When the queen of Sheba saw all the wisdom of Solomon and the palace he had built, 5 the food on his table, the seating of his officials, the attending servants in their robes, his cupbearers, and the burnt offerings he made at the temple of the Lord, she was overwhelmed. 14 The weight of the gold that Solomon received yearly was 666 talents, 15 not including the revenues from merchants and traders and from all the Arabian kings and the governors of the territories. 16 King Solomon made two hundred large shields of hammered gold; six hundred shekels of gold went into each shield. 17 He also made three hundred small shields of hammered gold, with three minas of gold in each shield. The king put them in the Palace of the Forest of Lebanon. 26 Solomon accumulated chariots and horses; he had fourteen hundred chariots and twelve thousand horses, which he kept in the chariot cities and also with him in Jerusalem. 27 The king made silver as common in Jerusalem as stones, and cedar as plentiful as sycamore-fig trees in the foothills. 28 Solomon’s horses were imported from Egypt and from Kue—the royal merchants purchased them from Kue at the current price. 29 They imported a chariot from Egypt for six hundred shekels of silver, and a horse for a hundred and fifty. They also exported them to all the kings of the Hittites and of the Arameans. The Lord is a jealous and avenging God; the Lord takes vengeance and is filled with wrath. The Lord takes vengeance on his foes and vents his wrath against his enemies. but with an overwhelming flood he will make an end of Nineveh; he will pursue his foes into the realm of darkness. “Although they have allies and are numerous, they will be destroyed and pass away. Although I have afflicted you, Judah, I will afflict you no more. An attacker advances against you, Nineveh. Guard the fortress, watch the road, brace yourselves, marshal all your strength! The shields of the soldiers are red; the warriors are clad in scarlet. The metal on the chariots flashes on the day they are made ready; the spears of juniper are brandished. Nineveh summons her picked troops, yet they stumble on their way. They dash to the city wall; the protective shield is put in place. It is decreed that Nineveh be exiled and carried away. Her female slaves moan like doves and beat on their breasts. Nineveh is like a pool whose water is draining away. “Stop! Stop!” they cry, but no one turns back. Where now is the lions’ den, the place where they fed their young, where the lion and lioness went, and the cubs, with nothing to fear?